If you were asked to defend why you’re pro-life, could you? The left has gone cuckoo for Coco Puffs over President Trump’s latest Supreme Court nominee, Brett Kavanaugh. They fear Roe v. Wade will be overturned and women who want to have an abortion will be relegated to old-school back alley tactics like using a hangar to kill their baby. Not to mention, abortion would be criminalized nationwide. But nothing could be further from the truth. The power to grant legal abortion would return to the states. Therefore, many states would continue to permit abortions. Although Roe is considered bad law, reversing it won’t solve America’s abortion crisis. We have a moral crisis, a constitutional crisis, as evidenced by the judicial activism that gave us Roe in the first place, and an educational crisis on our college campuses that guarantees pro-lifers have a long fight ahead of us. If we’re going to prevent the normalization of abortion in America, we’ll need to use stories that soften hearts, in addition to logic and law. Before I became a Christian, I was pro-choice. I bought into practically every nuanced pro-choice argument imaginable. Following my spiritual conversion, I continued to struggle with the issue until one afternoon drive when I decided to question God. His response, though not audible, changed my view on abortion forever. The words were so clear and pronounced it freaked me out! That’s a reference to Jeremiah 1:5 in the Bible. 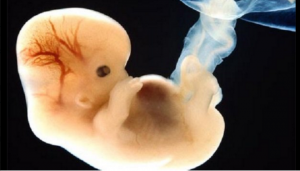 For years I had reasoned why I was pro-choice, and in a blink of an eye my heart was changed. I finally understood why so many Christians were pro-life. To them, every life mattered because everyone was a part of God’s purposes and plan from the beginning of time. No one is a mistake. That may be too spiritual or simplistic for some of you to conceptualize. But perhaps this acronym won’t be: S.L.E.D. The “S” stands for size. An unborn child should not be a candidate for destruction merely because he or she is small and in the early stages of development. Is a toddler’s life less valuable than an adult’s because it’s at an earlier stage? Of course not. Moving onto “L,” for level of development. We all understand there’s a beginning to life, an end to life and everything in between. When a woman announces she’s pregnant, we all know it’s a child inside of her that will mature to a newborn, a toddler, a teenager and unto an adult. This proves the developmental babies are persons in the womb. Now for the “E,” which stands for environment. Is your kid’s life less valuable when he’s playing outside as opposed to inside? What about when she’s at school or any other place where you can’t see or physically touch her? Is a kid in the ghetto deserving of less love than a kid in the suburbs? It sounds ridiculous, huh? Yet, this is the standard we apply to determining the value of the unborn. Why is an Eagle’s egg legally protected yet a baby in the womb isn’t? The answer is we know what’s inside of the egg, and our opinion isn’t swayed by its size. The same is true for puppies inside of a dog’s womb, kittens inside of a cat, or eggs that mature to be tadpoles and eventually frogs. Except for human babies, we don’t rationalize what other species are or aren’t when they’re smallest. Lastly, “D” stands for the degree of dependency. When a baby is inside of its mother’s womb, it depends on her for food, shelter, medical care and protection. Besides changing poopy diapers, washing clothes and holding them in your arms instead of the belly, what’s changed? Not much. From conception to adulthood a child is dependent on its parent on some level. Additionally, with the advent of DNA testing and ultrasounds, we now know that a baby has a separate DNA strand from its mother once the sperm fertilizes her egg. And with ultrasound there are studies that show babies have their own heartbeat as early as three to five weeks after conception. In other words, although they are growing inside of the mom, they aren’t a part of her body. Pro-choice advocates that say otherwise are science deniers. As for Roe v. Wade being settled law, if Supreme Court Justice Ruth Bader Ginsburg thinks it’s bad law, why should pro-lifers think any differently? According to law.uChicago.edu, in a speech she gave at the University of Chicago law school in 2003 to celebrate the 40-year anniversary of the 1973 SCOTUS decision that affirmed a woman’s right to an abortion, she believed the law was too far reaching and too sweeping, and that it gave pro-life activists an easy target to rally against for four decades. She would’ve preferred abortion rights were implemented incrementally through state legislatures and the courts. Ultimately, liberals don’t want Roe v. Wade overturned because they derive their morality from law, not from God. Therefore, if Roe is overturned, one-time proponents of the bad law will be forced to rethink their morality, and perhaps their allegiance to the Democratic Party.